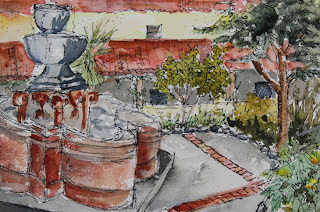 I did a very quick small pen and ink sketch in the central courtyard at the mission. Later, I did a larger ink drawing of the facade. It was my intention to add watercolor to both of them all along, which I got around to doing over the past couple of days. 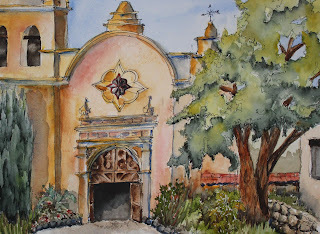 I particularly like the way the Italian cypress to the left of the mission front door turned out; perylene green-a deep green with a fair amount of black in it-was a good color choice for the base color here. It also helped me get some good foliage shadow colors. While at the mission, we observed that the dome is uneven, the window over the front door is off-kilter, and there are other little idiosyncrasies in the design! Lovely Janice! I really like the tree too and the way you did the mission walls. My eyes had a nice visit in this painting!